The HTC One M9 Plus wasn't announced today - do you think it will be unveiled later this year? HTC today announced three new devices: the One M9 smartphone, the Grip fitness tracker, and the Vive virtual reality headset. Previous rumors had it that the company would also unveil a One M9 Plus on this day, but HTC's MWC 2015 event is now over, and there's been no mention about this alleged Plus version of the new One. While most of the rumors surrounding the One M9 turned out to be true, right now we're not sure that the One M9 Plus even exists. It's said that the M9 Plus should sport a 5.2-inch display with 1440 x 2560 pixels (thus being HTC's first Quad HD smartphone), while also offering a fingerprint sensor. The rest of its features shouldn't be different from those of the regular One M9, including a 20 MP rear camera, UltraPixel front-facing camera, BoomSound speakers, 3 GB of RAM, and an octa-core Snapdragon 810 processor. It's hard to believe that the One M9 (which should be released later this month) will remain HTC's only new high-end smartphone throughout 2015, so could we see the One M9 Plus arriving sometime later this year? What do you think? Feel free to cast your votes in the poll below! And, if you haven't done it already, check out our HTC One M9 hands-on for a closer look at HTC's new (yet old) design philosophy. 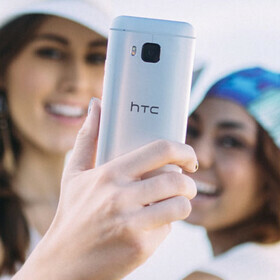 Do you think HTC will announce the One M9 Plus (or a Quad HD version of the M9) later this year? Hopefully. I'd love to see it compete with the Note 5. Doubt it. The M9 running WP10 will I'll guarantee you that. It will along with the NOTE 5 and just like the M9 is getting crushed even before the S6 is announced so will the M9 plus. In terms of sales? Almost certainly. In terms of quality? That remains to be seen, but I highly doubt it. There will be no HTC later this year. It doesn't matter if its released later or not, They missed the boat not releasing it alongside the M9, I am not waiting any longer, They lost a sale. I'm right there with you man. I LOVE my HTC One Max and am ready for an upgrade. In world where everyone has a large phone option WHY are they not coming out with the biggest baddest M9 Plus. It should have a huge battery, 4GB RAM. They really dropped the ball here. Now I'm thinking about going Samsung or LG or even iPhone Plus. I'm sick of waiting and I'm really frustrated at HTC. They already skipped one upgrade. I thought the M8 plus was going to be announced last year especially after the iPhone 6 plus. So I doubt it for this year so no. But I would love to be proven wrong. I don't think there is any M9 Plus unless leak and so far 0. Great to see a felloww One Max user here! I totally agree with you - the absence of the One Max 2/M9 Plus was the biggest disappointment for me today. The design of the One M9, though recycled, is still quite attractive. If this design were simply translated into a 5.5" - 6" form factor, the resulting phone would be a very compelling device, especially if the speakers were correspondingly more powerful. Hopefully they'll quit delaying and bring out the big guns soon.